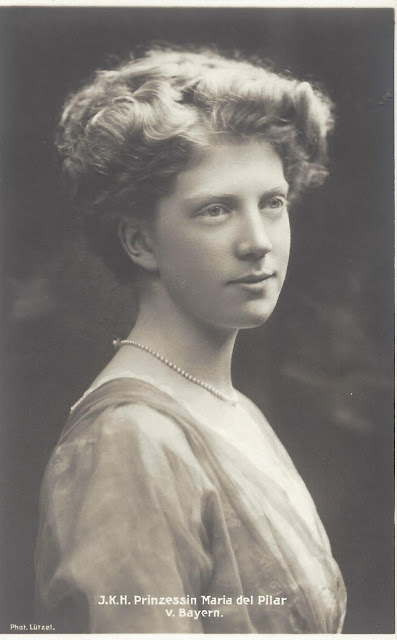 HRH Princess Maria del Pilar Eulalia Antonia Isabella Ludovika Franziska Josepha Rita Euphrasia of Bavaria (March 13-1897-January 29, 1987) was the only daughter of Prince Ludwig Ferdinand of Bavaria and Infanta Maria de la Paz of Spain. Pilar never married. She served as President of the German Red Cross for 40 years. She co-wrote several books including Every Inch a King, biography of her cousin, King Alfonso XIII. 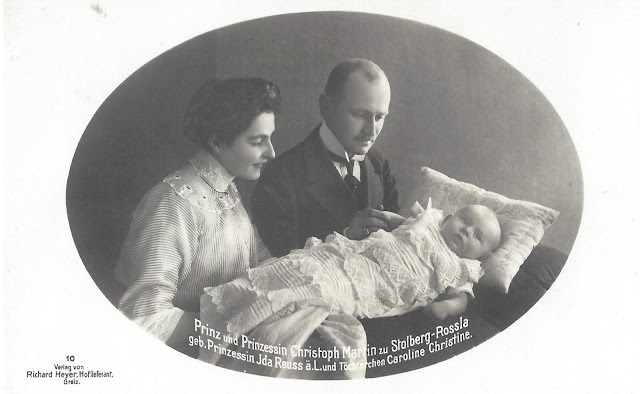 Princess Ida Reuss (September 4, 1891-March 29, 1977) m Prince Christoph Martin of Stolberg-Rossla on November 7, 1911. Christoph was the 5th of eight children of Botho, the Prince of Stolberg-Rossla, who was married twice. His first wife, Countess Marie von Arnim died in March 1880 nearly two weeks after giving birth to a daughter, Marie. Three years later, Both married Princess Hedwig zu Isenberg. Christoph was born on April 1, 1888 and died on February 27, 1949. He was the second son of Botho, who died in 1893, and was succeeded by his first son, Jost Christian, who was killed in action in 1916. Caroline Christine was married twice. Her first marriage to Hans Albrecht von Boltenstern took place at Rossla in 1935. He was killed in action in 1940. She married again in 1944 to Baron Wilhard von Eberstein. She had two daughters, Ruth Ingrid (1937) and Gisela (1938) by her first husband. Her second marriage was childless. Johann Martin's marriage to Hildegard Sauerbier was childless. The male line is now extinct. Marie Elisabeth married Prince Wilhelm of Schönburg-Waldenburg in 1939. He was killed in action in 1944. They had two sons: Ulrich (1940) and Wolf (1943). 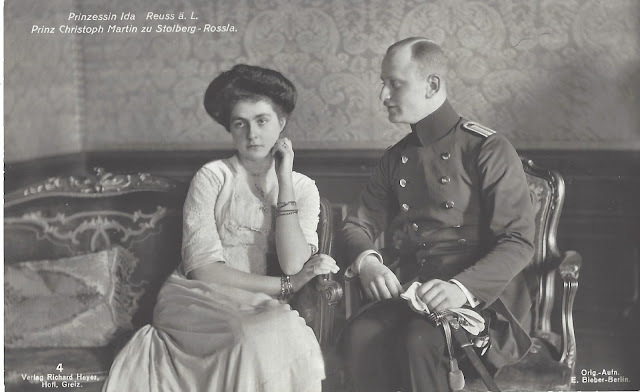 Wilhelm Ernst, Grand Duke of Saxe-Weimar-Eisenach (1876-1923) was married twice.. His first marriage (1903) was to Princess Karoline Reuss (1884-1905). Karoline was Princess Ida's sister. In 1910, he married Princess Feodore of Saxe-Meiningen ()1890-1972). 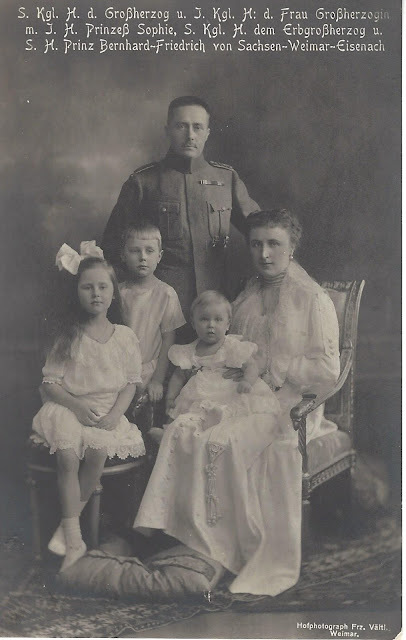 They had four children: Sophie (1911-1888) who married Friedrich Gunther, Prince of Schwarzburg (1901-1971); Carl-August (1912-1988), who married Baroness Elisabeth von Wangenheim-Winterstein (1912-2010); Bernhard (1917-1986) who married Princess Felicitas of Salm-Horstmar, and Georg (1921-2011.) Georg renounced his rights and titles in 1953, and took the name Jörg Brena. The present head of the Saxe-Weimar-Eisenach is Carl-August's son, Michael (146) who has one daughter, Princess Leonie. 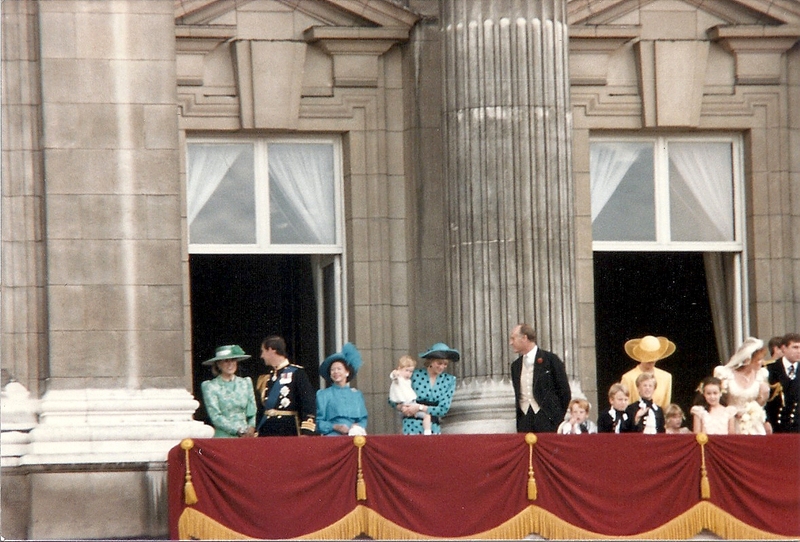 The succession will pass to Bernhard's son Wilhelm (1946) and his only son, Georg-Constantin (1977).